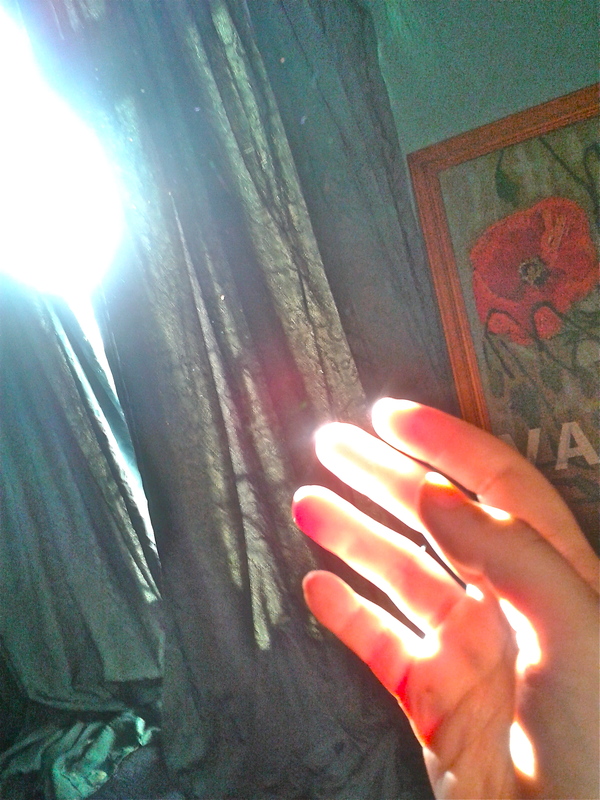 Watch how your hand and fingers shine in a beam of light. See the light illuminate your flesh from within, causing a glow. Become aware of that glow extending from the tips of your fingers. See the colour change. What colour do you see? Can you make out little lines or spikes forming from the tips of your fingers? Extend those outwards through focusing your thoughts, being open to the possibility that you can see that which we are told is unseen. The aura, the subtle energy body around and permeating your own ‘physical’ body can be witnessed. It can be manipulated, made to grow and extend. The first time I saw my own aura through concentrated thought it blew my mind. I watched tiny little spikes of intense violet become visible to my eyes around the tips of my fingers. I did it at night in low lighting. The violet spikes were not just at the tips but I noticed then that this colour was all over my hand and when I put my two hands close to each other the subtle energy would join forming little whirlpools and eddies between the hands. I began to play by gently grabbing and twisting the energy filaments, pulling and teasing them outwards, extending them. It is the thought which drives the energy. The more I practiced, the more I saw. The little spikes close to the skin are vastly complex structures in themselves and this is only one part. I watched the aura of a bedside plant and was astounded to realise that the plant was in a constant state of sexual excitement, constantly reproducing itself! It had little flashes of light all over, a constant chatter of activity and communication and I found that I could communicate with it by energy interaction! All is alive and imbued with this vibrant, organic, intelligent energy field. We can see it when we quieten and focus the mind and open ourselves to the possibility that we are more than just an organic machine, we are made of actual light. We glow from within. One night I watched as little globules of glowing energy formed on my wall. The wall was completely covered. We are literally swimming in a sea of ‘unseen’ energy. It is through this act of ‘seeing’ that I became more and more aware that there is a ‘sense’ which we have that the ancients talked about, a sense much more incredible than what we are told as children. We are more than the 5 senses we are taught. We have an amazing ability to access these other vibrations through focusing and quietening the mind and body and all it takes is the act of opening ourselves to exploration and play. The stuff of life is endlessly complex and fascinating. Never be afraid to just play. You may amaze yourself.